With so many moving parts happening all at once, I thought this would be a good time to explain some of the different sectors in the bond market, their risk profile, and our approach at HFS Wealth Advisors. 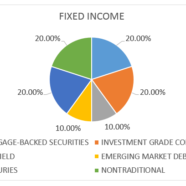 Similar to equities, there are different sectors that make up the fixed income market and each has a different risk exposure and profile. Because indexing in fixed income is difficult and costly, we favor active management to meet our clients’ needs. Unlike in most equity classes, research has shown that active management, over the long-term, tends to outperform passive indices even after taking into account fees. Below I highlight some of the different sectors where we add exposure. Treasuries are the largest and most active fixed income market in the world. Because of the high credit quality granted to the U.S. government, treasuries are the benchmark to other sectors of the fixed income market. Since there is little to no credit risk in treasuries the main risk is changes in interest rates. Bond prices move inversely to interest rates, so as rates have been going up the prices of bonds have been heading in the other direction. Lower duration bonds are less sensitive (price will go down less) to interest rate changes than longer-dated bonds of the same quality. Mortgage-backed securities (MBS) are pools of mortgages that have been packaged into a security and then sold to investors. Prepayment risk is the key risk for MBS and occurs when rates are falling and homeowners refinance, or prepay their mortgage. MBS issued by Ginnie Mae are backed by the full faith and credit of the U.S. government and will have a higher yield than treasuries of the same maturity as they carry slightly higher risk. Investment-grade (IG) corporates are debt issuances of corporations that have been given a high credit rating from a debt rating agency (Moody’s, S&P, and Fitch are the main ones). The primary risk of IG corporates is credit spread, the difference in yield of a debt issuance to a similar maturity treasury. As the credit spread compresses (IG bond prices go up) the likelihood of default decreases and when it expands (IG bond prices go down) the likelihood of default increases, usually during a recession. Core bonds will make up a majority of a client’s fixed income exposure as it provides high-quality income yielding sources with a low or negative correlation to equity movements. High-yield (HY) corporates are debt issuances of corporations that have been given a low, or “junk”, credit rating. HY bonds have much wider credit spreads than IG bonds and are more susceptible to default during a recession. The tradeoff is that during an expansion HY bonds will pay a much higher yield and will benefit from much larger spread compressions. Emerging market (EM) debt are issuances by corporations or governments of EM countries. Similar to HY bonds, EM debt tends to have a higher spread and is susceptible to higher levels of default, geopolitical issues, and currency movements (most debt is issued in dollars). Both HY bonds and EM debt provide a higher income source for a higher level of risk. Other than income, EM debt can provide a diversification factor through currency fluctuations. Better known as TIPS, these are treasury securities that are tied to levels of inflation and will perform better than treasuries in rising inflation environments. Floating-rate securities are debt issues with a variable interest rate tied to a benchmark (treasuries or LIBOR). As yields of the benchmark go up so do the prices of the bonds. On the flip side during a falling rate environment these tend to move inverse of what a normal bond would do. Unlike agency MBS, non-agency issues do not have any government backing and therefore will have higher risk and yield. These are the securities that severely damaged the financial system over a decade ago when banks gave mortgages to consumers that could not afford them and packaged them as low-risk high quality pools. Fortunately, banks have become more stringent in their loan approval and households, still remembering the last crisis, are taking on less debt and running a better balance sheet. ABS refer to other consumer loans excluding mortgages (credit card, student loans, and auto loans, etc.). We currently favor nontraditional sectors due to a rising rate environment, steadily climbing inflation, and strong household balance sheets. As we near the end of the business cycle we will begin to reposition to core bond sectors that will begin to have more attractive yields and are higher in quality.